With the earlier success of their Kinetics KC821XL1-01 travel case for the XL1, CasesPlus, Inc., of Santa Rosa, California established itself as a storage and shipping solutions provider firmly dedicated to the needs of the DV community. 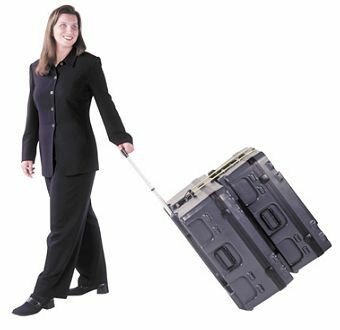 The Kinetics KC281 case is designed specifically for airline travel, with compact dimensions which permits it to fit as carry-on baggage in most standard commercial aircraft overhead bins. Its use requires breaking down the XL1 into smaller components, a procedure which could hamper the usability of the case on a daily basis when not flying around the country. CasesPlus therefore saw the need for a larger, "drop-in" style XL1 hardshell case and has responded by adapting a North American TC2000 series box for this purpose. The obvious advantage of a drop-in camera case is the ability to pull the camera out, shoot, and put it away without having to diassemble anything. Rather than settle for housing the standard XL1 configuration, CasesPlus went a step fruther and designed the TC2000 interior to allow for a fully assembled XL1 with attached MA100 shoulder pad/audio adapter and the three LightWave Systems audio accessories (the EQ-XL1 Equalizer, the MM-XL1 Mini-Mount and the SI-XL1 System Isolator). There's also room for an extra lens, camera batteries and cases of DV tapes, providing one convenient storage and travel solution for not only the XL1 but also its most popular accessories. Compare that to Canon's own bright silver cases which lack protective foam padding and require breaking the XL1 down to get it to fit. The case measures 28" x 14½" x 17½" and sports a stylish muted gray-green exterior molded from high-density polyethylene plastic. It's tough yet fairly lightweight. A pair of wide-spaced ball-bearing wheels are recessed at one end on the bottom, protected from damage by shrouds, with a telescoping pull handle at the other end to let you easily wheel the case around. There are three spring-loaded grip handles (I never liked loose ones that tend to flop around) and they're also recessed into the molded case body, like the rest of the hardware. These handles are at the front and each end of the case, so you can carry it one-handed, suitcase style, or grab it like a barrel with both hands if you need to. There are indentations along the bottom with matching contours across the top for stacking with other TC2000 series cases. A full-length anodized piano hinge opens the lid, which is held upright by a pair of lid stays. The body is sealed weather-tight with a rubber gasket around the lid. This case is lockable and there are four military type twist-draw latches to secure it. Inside there's at least two inches of foam protection all the way around the camera well. The well itself holds the XL1 snug and secure, with or without the LightWave Systems tools or the MA-100. One thing I like in particular is that if you're using the LightWave SI-XL1 System Isolator, the case forces you to adopt a good habit. The Isolator phyically moves the entire EVF assembly forward a couple inches. In order to drop the camera into this case with the Isolator attached, you must rotate the viewfinder eyepiece 90° down. This should be your standard practice regardless, anytime you're shooting out of doors. Keeping the viewfinder pointed down when you're not looking through it prevents prolonged exposure of the LCD viewfinder screen to damaging sunlight. Pull the XL1 with Isolator out of the CasesPlus TC2000 case and the EVF is already pointing down. Go ahead and put the camera on your tripod, and don't worry about viewfinder sunburn. A small pre-etched perforated section at the right side of the camera well can be plucked out to accomodate an attached MA-100. A cut-out in the lid above this section allows clearance for the MA-100 metal accessory mounting plate, too. There's a deep well for an extra lens and a smaller one for some extra Canon BP-series camera batteries. CasesPlus knows that it's smart to keep tapes and batteries separated, so there's yet another deep well perfectly sized to hold several DV cassette five-packs. Don't need to bring that much tape? Then use that space to store the AC power supply and charger along with a lens controller. This is an awesome case and I had to look hard to find anything to criticize. There's only a few minor nit-picking issues. For instance, the neccessarily snug fit of the camera well to the XL1 body does not allow for the larger size BP-945 battery to fit into the XL1 battery compartment (the BP-930 fits fine). There wasn't enough room for the dual battery holder to be mounted on the MA-100 without using a larger case, but it will fit in one of the wells. The precisely shaped foam cut-out in the camera well allows for only the standard 16x lens and the XL1 body (I would like to see CasesPlus accomodate the 3x lens also with its odd-shaped hood in this space while still maintaining the perfect body-hugging fit of the foam interior). The FU-1000 B&W CRT viewfinder will probably not fit into the camera well, but you could always call CasesPlus and inquire about a custom internal configuration. Finally, speaking of the foam, there's one more feature worth mentioning. Usually a big drawback of interior foam cushioning is that it tends to flake off into pieces over time and heavy handling. We've all seen the insides of cases where the foam has been steadily disintegrating away. CasesPlus takes measures against that problem with an effective solution. The top one-inch layer of foam in this case is a denser, more robust material than the layers beneath. It's tough and it resists unsightly peeling and poking fingers while protecting the softer foam below. 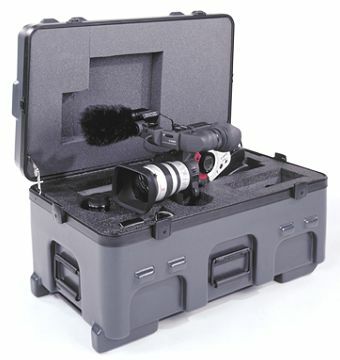 This kind of functional detail, combined with rugged durability, security and an aesthetically pleasing exterior, puts CasesPlus squarely at the top of high-value, conscientious storage solutions for the DV videographer and filmmaker. I suppose this is about the best camera case of its kind, certainly the Cadillac of affordable hardshell cases. If you're out in the field often or travel a lot, you're really going to want one.